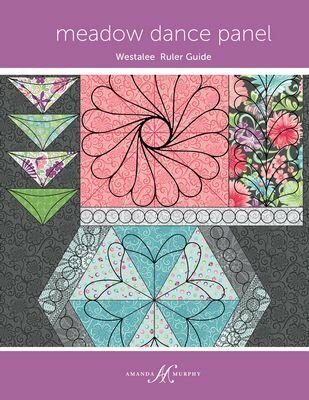 Have you been wanting to learn how to use the Westalee rulers but needed a class? Then look no more. Janean's BERNINA is having two workshops with Sandra Swick, a BERNINA educator. The morning class will work with the "Meadow Dance Beautiful Borders" rulers and the afternoon class will work with the "Meadow Dance Feather Focus" rulers. You will have two different end results if you take both classes. As part of your fee, you will receive a copy of the booklet "Meadow Dance Panel Ruler Guide", a sample quilt sandwich for warming up, and a quilt sandwich using Amanda Murphy's Meadow's Dance Panel. Each participant will need to purchase the ruler kits for their respective class. If you wish to take both classes, save 15% on the class and ruler kits (Feather Focus and Beautiful Borders ruler kits). See the class supply list for a complete supply list. Registration ends February 20th so we can get your kits ready! Register online or in person. Register early so we can order the correct amount of rulers. Materials Included: Amanda Murphy Meadow Dance Panel in a quilt sandwich, Meadow Dance Panel Guild, and practice sandwich. Requirements: Westalee "Feather Focus" ruler kit. 72 ruler work foot (or foot for your machine) See supply list for complete list.